Iyama regains sextuple crown: The third game of the 41st Tengen title match was held at the Munakata Yurix* in Munakata City, Fukuoka Prefecture on November 25. Taking black, Iyama Yuta (right) forced Takao Shinji (left, in white shirt) to resign after 147 moves. Iyama took a decisive lead in the first large fight of the game and wrapped it up by killing a large group. This win won back the title he lost to Takao on December 19 last year. He also once again held six of the top seven titles; this is his third sextuple crown. Overall, this is his 34th title, and his winning streak is now 24, which puts him in equal second place in modern tournament records with Rin Kaiho, Hon. Tengen. With his twelfth successive win in title matches, he also equals another record, one set by Sakata Eio. Iyama’s cumulative record in title matches is 100 wins to 49 losses, a winning percentage of 67.1%. Click here for Go Game Guru’s report, with game records and more photos. * the Munakata Yurix is an elaborate complex of facilities including a large library, planetarium, various halls, and sporting facilities. Surprise leader in Honinbo League: A surprising player has taken the sole lead after just two rounds in the 71st Honinbo League. 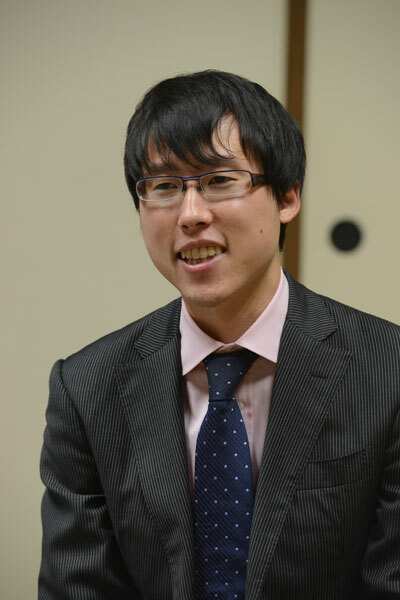 The final game of the second round was played on November 26, and league newcomer Motoki Katsuya 7P (W) beat Yamashita Keigo 9P, the top-ranked player in the league, by 1.5 points. Motoki is the only player on 2-0.